We’d love your help. 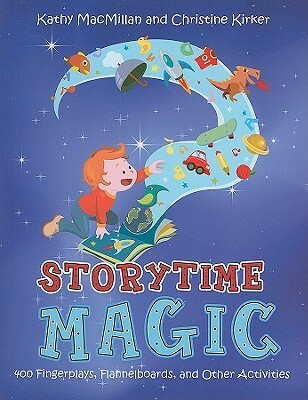 Let us know what’s wrong with this preview of Storytime Magic by Kathy MacMillan. This time-saving resource includes thematic organization to make programme planning easy, recommended books for each theme, easy-to-follow craft and flannelboard patterns, and quick tips boxes that enhance the early literacy component. To ask other readers questions about Storytime Magic, please sign up. Some great ideas for beginners/those new to story times. The book is organized by theme, making it easy to quickly find ideas. Appendix B also has some excellent quick guides on different materials for story time that you can make quickly and inexpensively (such as flannel boards, puppet sticks, lap theaters, etc.). Enriching and supplementing storytelling programs with fingerplays, flannelboards, and other props will be a cinch thanks to this generous sampling of art and craft ideas, songs, and action rhymes." "A unique addition to the programming shelf, this treasure trove of storytime tools is designed to help veteran librarians refresh and enliven ongoing programs, while providing novice storytime planners what they need to get started!" Website has lots of pattern Enriching and supplementing storytelling programs with fingerplays, flannelboards, and other props will be a cinch thanks to this generous sampling of art and craft ideas, songs, and action rhymes." "A unique addition to the programming shelf, this treasure trove of storytime tools is designed to help veteran librarians refresh and enliven ongoing programs, while providing novice storytime planners what they need to get started!" I stumbled upon this book at the library...while looking for something else and then went out and bought a copy I liked it so much. This is a great resource for anyone who plans and executes storytimes...or even for someone thinking about planning and executing them! Some great ideas in this one! I immediately made the ice cream shop flannel. Great resource for children's librarians.